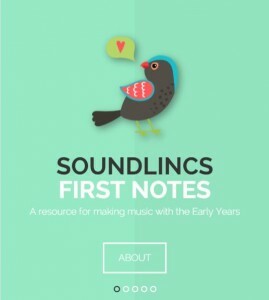 First Notes is soundLINCS’ exciting new music resource app for use in Early Years (EY) settings or by parents and carers at home – especially those without any previous experience of music. It’s packed full of exercises and activities designed to suit all ability levels to help w ith a child’s development in and outside of music. The App links directly with the areas of learning and development covered by the Early Years Foundation Stage (EYFS), allowing practitioners in EY settings to complete EYFS Profiles and build their own schemes of work. For parents and carers, the App provides a great range of fun and creative ways to bring music into the home by engaging young children in activities tailored to their continued development. There are more than 60 unique activities split into categories, from Name Games and Warm-Ups right through to Instrument Making tutorials showing you how to create your own instruments to use with the App. The category menus are easy to find and you can switch between them by simply swiping your finger. Once you’ve found the right category, all of the activities will be listed ready for you to choose. Each activity page starts with the equipment list – all of the things you might find useful when working through the exercises. The se are only suggestions, so feel free to get creative and find alternative ways of making music. If you’re ever unsure about an instrument in the list, our Instruments page contains a demonstration video for each of the 26 instruments you’ll find throughout the First Notes App showing you what they are and how they’re played. 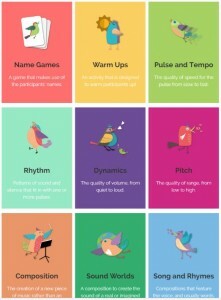 The App has been designed to enable progressive learning and development in music to meet every child’s needs. The pages are split into sections that explain the activity and where to start. Eventually, the When child is ready, move on sections allow you to add new challenges and enhance skills, keeping the activities fun and dynamic for all ages between birth and 5 years old. This means that there are over 120 creative exercises that you can use with all children in the EY age range. Many of the pages include Music Tracks, playable at the touch of a button, which can demonstrate and accompany the songs found in an activity. You can find lyrics and actions for each song on the pages and the instrumental version of each track provides a great backing to sing along to. A full list of all 45 tracks can be accessed through the Quick Menu for fast and easy selection. As well as helping with progression, each activity on the App contains an Inclusivity section providing you with useful suggestions to promote total inclusivity when carrying out any exercise. Adapting the activity for use with Hearing-Impaired and those with reduced mobility makes the App suitable for use with everyone. A key feature of the App is that it links to the EYFS areas of Learning and Development. To allow for the completion of EYFS Profiles, the bottom of each page has four circles that show which aspects of the EYFS can be covered by the chosen activity. It is also possible to search for activities that cover specific areas of the EYFS using either of the two menus. This will bring up a list of activities relating to a certain theme or area of Learning and Development to enable users to creatively supplement areas of their curriculum such as Self Confidence and Self Esteem, Physical Development, Making Relationships and many more besides. To assist in the curriculum-based approach even further, the App contains an Activity List feature where users can save their favourite activities, or activities that follow a theme (animals, nature etc.) and find them all instantly from the Home Screen. 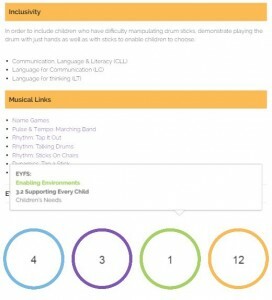 First Notes is based on the highly successful soundLINCS First Notes Resource Packs which have been developed over 12 years of working with EY children alongside their parents, carers and EY practitioners throughout Lincolnshire. soundLINCS hopes that you will enjoy finding your own paths through the First Notes App and discover activities that enhance, enable and encourage music-making with children.